Our Online Backup is offered as Backup as a Service (BaaS), which offers a fully automated, encrypted online backup and recovery service allowing organisations to back up their data off-site, over the internet and/or dedicated IP links to our remote data centres. The service automatically protects data residing on desktops, laptops, servers and network attached storage devices according to retention policies and schedules set by the user. Data is compressed, encrypted and sent to one of our secure state of the art data centres before it is replicated to a second secure data centre assuring the data is safely offsite for disaster recovery and regulatory compliance purposes. 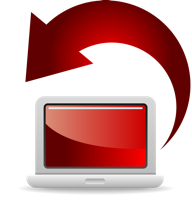 When data recovery is required, users can simply select the data to restore using an intuitive interface or for large data sets, the data can be returned to site for local, high speed LAN based recovery. The service has been developed in line with business needs and is scalable; the service will grow and evolve with your business data and meets the needs of small, medium and large organisations. Our online backup service eliminates capital expenditure and offers reduced operational costs compared to running the backup and recovery in-house. When you look at the costs of running a backup and recovery solution, you need to consider how much manual process, time and effort is required to run and administer the solution and how much this costs. Then there’s hardware. How much are tape media and drive/library upgrades costing per year? How often do tapes or drives fail and what is the cost to troubleshoot tape backup processes when failure occurs? What does it cost to keep training staff and to move tapes off or between sites? 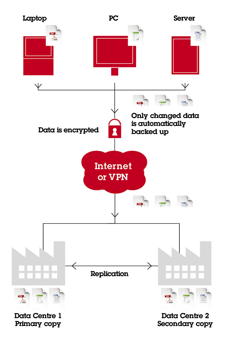 How secure is your backup data and do you encrypt sensitive information? What is the cost of lost data? What are the annual software costs to maintain the environment? It all adds up! Our service automates the entire process, freeing up staff from managing the backup process and allowing them to focus on core business tasks. It drives down storage management costs and significantly improves backup Service Level Agreements (SLAs) internally.